Greg Laabs › Mostly pointless. For Christmas, my wife and I gave our family the gift of a puzzle to solve. 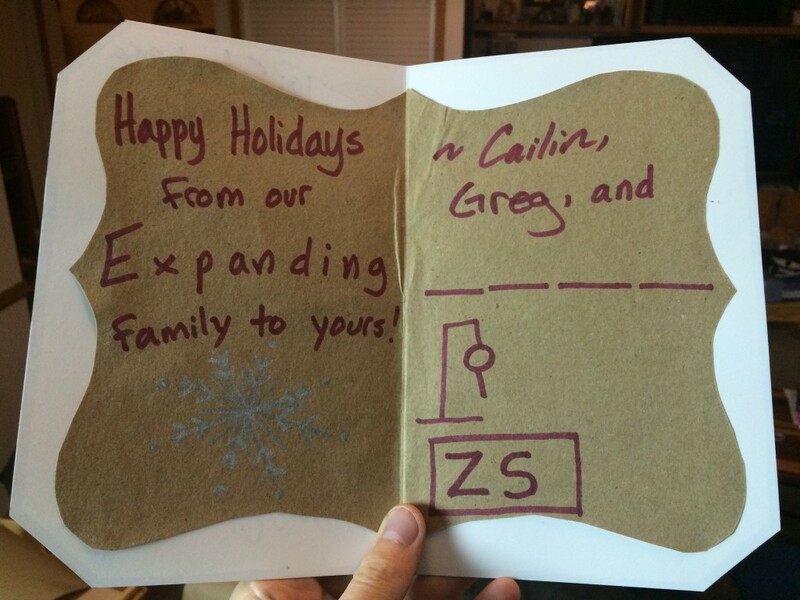 Everyone in the family received a similar handmade Christmas card from us, staggered throughout Christmas Eve and Day. By combining the 9 cards that different groups of people got, the family would have the information they needed to figure out the baby’s name. The day after Christmas, I got to experience the joy of being on an email thread with my entire family, each of them putting forth effort to solve the puzzle. The engineers in the family immediately found data from the Social Security Administration of the most common names in the US over the past 100 years, and used that list to programmatically start narrowing down the list. Some time was spent calling up remote family members to verify their letters. 41 emails later, the family had what they believed to be the most probable name based on the list, and they got it right: my soon-to-be-born son’s name is Finn. As a programmer, creating the puzzle was great fun. 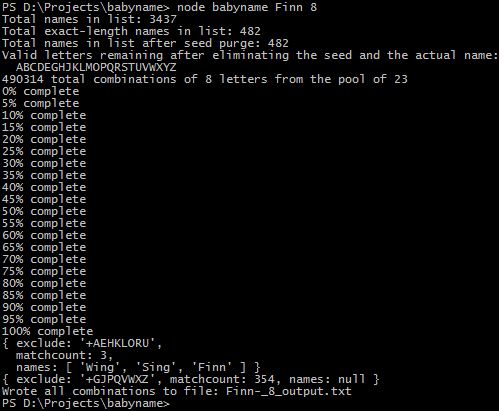 I wrote a Node.js program to come up with combinations of letters in the alphabet that could be excluded using similar SSA name data that my family ended up using. The goal of the puzzle design was to make it so that no single card would eliminate too many possibilities. Once I figured out the total list of letters I wanted to give to the family (my list ended up being 19 letters, out of the 23 I could have given them) I wrote a second script that checked to ensure that no combination of cards short of the full set could solve the puzzle. It was a fun hastily-thrown-together programming exercise that I am certain I approached from the entirely wrong direction, but it worked! I tossed the code up on GitHub, even though it is a horrible mess of a Node.js script that nobody should ever use. Anyway, the whole thing was a giant success. If you’re looking for a fun way to reveal the name of your baby to family, and have a family full of puzzle-minded people, consider a hangman puzzle! I wrote a D&D application. I consider it to be in alpha, and I’m releasing it here for people to try out. Over the weekend I ran several “playtest” encounters with a few of my regular players. It was much different than our usual role-play-heavy sessions, because it was just pure combat. We said that we were practicing on the holodeck. The point is, I took this opportunity to really examine what parts of combat could be sped up. I have always been dissatisfied with how long our combat takes and am always interested in doing whatever I can to make things go faster. And during these few encounters, I found one: My dice rolling. I realized that I spend a considerable amount of time rolling my 20, forgetting what the attack bonus was, checking the monster card, adding the total, announcing it, and THEN if it hits, checking the monster card again because I forgot what the damage was, finding the dice used for that attack, rolling the total and then telling the player. This process is fine for players; it’s an exciting part of the game for them. Everyone likes rolling attacks! But for the DM, I am doing this a LOT every single turn. In fact I am on average doing it 5 times more often than each of them are, double or even triple if there are minions! This time adds up. That’s when I got the idea for this application. I wanted a simple application where I could feed it a list of attacks, and it would give me simple buttons to roll each attack. All it would do is give me the total attack value, which defense it was versus, and the damage it will deal if it hits. So that’s what I made. I currently call it “Avandra” which is named after the D&D god of luck. I’d like to make the name a little more descriptive like “Avandra Dice Manager” or “Avandra God of Dice” or something silly. Post suggestions as comments if you think of anything! As stated above, the main part of the application is little more than a list of dice “macros” that will roll if you double click on them. It’s very simple, and works well. The only big disadvantage is that there is no way to add new macros to it while running; you have to modify your macro file and then restart the application. That’s something I’ll add in the future. As you can see, there is also a “Temp Bonus” box in the lower left allowing you to apply temporary bonuses (or penalties) to the attack roll to account for combat advantage, enfeeblement, and so on. The second major feature is an implementation of an idea I’ve had for a long time, and related to a concept I have been thinking about for my Perfect Encounter Manager: The “Player Window.” This is a window that is meant to be placed on a second monitor (most likely plugged in to your laptop you use while DMing) that is facing the players. It’s a screen that all of the players can see that displays useful information. Specifically, Avandra uses it to show the dice rolls of the monsters, in an animated fashion. As long as the player window is open and the “Public” checkbox is checked, any time you roll for a monster, the Player Window will go to work and display what the monster rolled. The screenshot doesn’t do it justice, because in reality it’s animated. The attack roll number “rolls” for a second before settling on a final number. 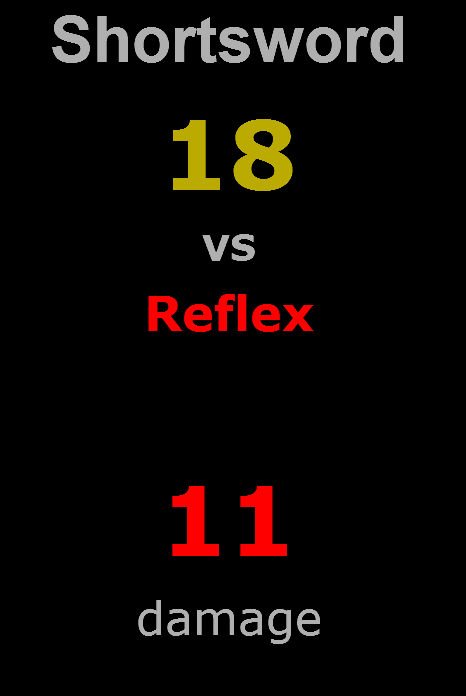 It is then color coded based on the result (gradually turning from green to red between 5 and 15) and then the attack bonus is revealed and the number quickly ticks up to the final result. Finally the defense is revealed. If the attack hits, you can choose to reveal the damage which causes the damage as well as possibly a quick description (“damage, and stunned (save ends)”) to fade in for the players. One: I think public DM dice is more fun. It adds more suspense for the players because they feel like they really are at the mercy of the gods of fate. When rolling behind a screen, some of the suspense is missing, because the players are never really sure if the results you’re saying are actually true. Lying is well within you right as a DM, but it does take something away from the players. Two: Having a computer roll the dice for you takes a little something away from the fun of D&D. I knew this when I set out to create the program. I felt it was an acceptable sacrifice for the purpose of speeding up combat. The players still get to roll all of their own dice, of course. I feel that this feature helps maintain some of the fun of physical dice rolling. The animated number helps, at least a little, keep the feeling of excitement you get when rolling a real d20. I have not personally used this yet during a session. I plan in trying it out Thursday, and I will be sure to find out from my players if they thought it added anything of value to the experience. If you end up trying it with your own players, please let me know how it goes! Using Avandra is very simple. First you need to install it from this link. You will need Adobe AIR, which it should offer to install for you. If it does not, please let me know. I haven’t tested this on a machine that doesn’t already have AIR. You can download this example file here. When you go to add your own attacks, it is important that you follow the format exactly. Specifically you need to have an attack name followed by a colon and then a space. Then a dice expression, followed by “ vs ” and then a defense name, then a comma, then a dice expression for damage, a space and then you can put anything after that you like for the damage description. Also, you dice expressions must not have any spaces in them at all. “1d20+13″ will work but “1d20 + 5″ will not. If you deviate from that formula at all, the program will crash. This is an Alpha release. There is virtually no error checking at all, as is evidenced by the strict requirements for the attack macros. If you follow the directions exactly it should work just fine! Please let me know what you think of it, either as a comment or an email. Music is as important to a D&D session as miniatures and dice. After a year and a half of using music in every one of my D&D sessions, I now believe the above statement to be completely true. I have found that the right music played at the right time adds an incredible amount of immersion and excitement to an already immersive game. However, finding the right music to use, and then knowing when the right time is to start each track, can be a pretty difficult challenge. No lyrics. This one should be obvious. Lyrics are distracting. Not iconic. I very much dislike using highly recognizable music. The Lord of the Rings soundtrack for example, while very good, is extremely recognizable by any fans of the movies. It’s a bad idea for the same reason the old 3e Player’s Guide gave for not using character names from other fictions: It stifles immagination by putting preconceived images in people’s heads. I don’t want people thinking of the battle at Helm’s Deep while we fight an epic D&D fight: I want them to be thinking of their own fight and how it is iconic and amazing in its own unique ways. Must fit the “era.” This one is trickier to define, but is usually easily noticeable when it doesn’t fit. It needs to “feel” like a fantasy or medieval soundtrack. Sci-fi movies and games, for example, typically have a very different feeling soundtrack. Needs to loop well. By this I do not mean that the end of the track needs to blend with the beginning of the track; that is nice but not required. What I mean is the track needs to maintain a fairly even pacing throughout its entire length. If a track starts out slow and then grows in to a big crescendo it will not make a good D&D track. D&D combat takes hours, not minutes. So if there is a big crescendo in the music every 3 minutes, it will be distracting. The most common place I look for excellent D&D music is video games. Video games often have great soundtracks that loop well and aren’t too overpowering, because they too have variable-length combat sequences where the music can’t presume much about what the player is experiencing. Movie soundtracks tend to not be very good options because they are much more dynamic. After I find the right music, I need a good way to know when to play the different tracks. This took me a while to develop a good system for, and eventually I settled with one that is very simple: I name the tracks based on the feeling they give me when I listen to them. I went through all of my tracks from the various soundtracks, and added words to the beginning of the filename that describe when I might want to use them. I use words like “action, fast, peaceful, grand, serene, morose, dark, suspense.” Then, during my session, I can quickly pick a track based on what is happening in the game and be fairly confident that it will fit the scene on my first try. The last thing I want to do is play a track, realize that it’s no good for what’s happening, and have to start a new one. Talk about immersion killer! I’d like to give a specific example from last week’s session. Last week I ran what I consider to be one of the best sessions I have ever run. The events included a climactic battle with a major enemy including a skill challenge mid-battle, a frantic escape from an erupting volcano and collapsing mine wherein one of the players fell unconscious and had to be carried out, and then finally a huge player-driven roleplaying event where one of the characters announced to the party that it was time for him to finish his personal quest, which was in the opposite direction of where the party was headed next. As the character made it clear that he was leaving and wanted anyone that would join him to do so, most of the rest of the party knew that they could not, because the very last part of their year-and-a-half journey was right around the corner, and if they delayed it could mean the end of all life. And this is the track I used for when the character left the group. I didn’t play it until after the discussion had taken place. I started this track the instant negotiations were over and it was time for him to say his farewells. So this track was playing while each character shook the hand of the departing one and said some final words about their time together, and then when the leaving character got on his phantom steed and rode off in the opposite direction, along with one other character who had decided to go with him. I had never used this track before, but I had been saving it for the perfect moment. I knew from the time I first heard it that it could be used at just the right time for an amazing impact. I was right. I left the track running after the departure, during the quick summary of their week-long journey to their final destination. I felt it helped represent what a trip like that might feel like. There is happiness that they are finally going to stop the cult that they have been hunting for so long, but it’s bittersweet as two of their long time companions have left them. My wife told me later that she very nearly cried during the farewell. And I almost cried when she told me that. If that isn’t an indication that I’m doing this whole DMing thing right, then I don’t know what is. I’ve been playing Dungeons and Dragons for many years. I started back in second edition, played quite a bit of 3e, and am now running a 4e campaign that has been going strong since 4e’s release. Throughout these many years, I have search far and wide for the perfect encounter manager. I have tried dozens of different tools over the years, and they have all had one thing in common: They are awful. It’s a sad truth. The majority of the options out there are not just “not great,” but rather they are terrible. I try them out and I cannot imagine how people actually use these tools on a regular basis during a session. Most of them require way too many clicks to do extremely common tasks, lack flexibility, and are just plain ugly. Even the ones that aren’t terrible are still not nearly good enough to be usable during my weekly sessions. There is, however, one exception. IniTracker by Andrew Lieffring is the first encounter manager I have ever used that I actually feel comes close to what a proper encounter manager should be. It has an attractive, subtly animated presentation. It displays the information you most often want to see at a glance. It does a small amount of automatic processing (like damage reduction for resistances,) and doesn’t require an obscene amount of clicks to do common operations. It is in fact the first encounter manager I have actually found myself using during my sessions. It’s good enough. As good as it is though, it is still far from perfect. It lacks a lot of flexibility to recover from mistakes: You can’t add a combatant after combat has started, you can’t reorder the initiative without a lot of work, you can’t simply “set” anyone’s HP directly to a value, as well as other things. And the biggest problem for me is the fact that even though it doesn’t take 10 clicks to do everything, it still takes too many. Adding and subtracting hitpoints is the single most common thing I need to do in the tool, and it makes me click a button just to bring up the “I want to make HP changes” panel. And finally, there are no keyboard shortcuts. Ideally I would never have to use the mouse, and instead just be able to type a few letters to accomplish what I want. In fact in its current state if you accidentally press enter while in the “HP” field, it completely ends the encounter and you lose everything. I only made that mistake once! I have decided to build the perfect encounter manager. Be more useful than paper and pencil. Be quicker and easier to use than paper and pencil. Unfortunately these two goals are exceptionally difficult to accomplish. If a DM finds that he can keep track of all of the monsters’ hitpoints and statuses on his scratch paper more efficiently than he can using the encounter manager, then the software has failed. Paper and pencil is already a very fast method, not to mention infinitely flexible. This is why making the interface as quick and intuitive as humanly possible should be the number one thing on a designer’s mind when trying to design an encounter manager. If the DM wants to subtract 17 hitpoints from a monster, he should be able to in less than 4 seconds, because that’s how quickly he could jot it down on his paper. Accomplishing those two goals will be my primary aim during the course of creating this tool. Keep track of the initiative order of all combatants. Keep track of the current hitpoints of all combatants. Keep track of temporary status effects on any combatants, such as dazed, prone, blinded, etc. Display all of the above information in an easy to read, attractive format. Remind the DM when important events happen, such as a combatant becoming bloodied, a status effect ending, a saving throw needing to be rolled, and others. Allow additional combatants to be added at any time. This is a work-in-progress list, but I believe that covers the most important bases. Here I will outline what I consider to be notable features. These are elements of the manager that will be an important part of the design, but don’t quite fit in to the much more general “What should it be able to do?” section above. Import characters from .dnd4e Character Builder files. Then automatically watch the source files for changes, and when one is detected, prompt the user to update the data in the manager with the new data in the .dnd4e file. Every operation will be possible to execute by typing in a shorthand command. This will allow 100% control of the application via the keyboard. I want to in some ways simulate what a DM might write on a piece of paper. If I type “drag stun save,” the application will know that the dragon now has the “stunned” condition with a “(save ends)” end condition. Similarly “10 fire id2″ will deal 10 fire damage to Intellect Devourer #2. “15 temp Melek” will give Melek 15 temporary hitpoints. Stats tracking. I am a stat whore. At the end of combat, I want to see how much time was spend on each turn of each round. I want to see a log of events throughout the entire combat. I want to see how much damage of which types a combatant took. Since the software is handling all of these events as they happen, it’s trivial to keep track of them and allow them to be viewed at the end of combat! Undo, not confirm. Confirmation boxes are terrible. You should never ask the user “are you sure you want to remove this combatant from the battle?” If the user didn’t want to remove him, he wouldn’t have clicked the button. In the much rarer event that a mistake was made, there is an “undo” button to undo the last operation. But then it hit me. I will write this application in a platform I have been dying to find an excuse to work in: Adobe AIR. If you don’t know, AIR allows developers to write applications in ActionScript that run outside of the browser. It’s 100% cross platform, with all of the benefits of being a full desktop application. It’s perfect. Plus I’ve been very impressed with a few other AIR applications I use on a regular basis, such as TweetDeck. If you are reading this, it is hopefully because you too are interested in an application like I am describing. This is where you come in: Have I missed anything? This is your chance to leave a comment here explaining what features you have found lacking (or perhaps even features you like) in other encounter managers you have tried. This is the absolute best time to let your opinion be heard, because now is the time when I am most able to consider big features. So, leave a comment with your thoughts! My players found a HUGE DIAMOND. They have infiltrated part of the cult that occupies the Crater Ridge Mines. They posed as a combination of new members as well as a replacement for one of the higher-ups that was killed (you’ll never guess who killed him!) With the hard part behind them, they were now (mostly) free to wander about the temple without arousing any suspicion. They decided to change their previous plans and instead wait on jumping the high priestess. They figured maybe there could be more to learn if they keep up the ruse a while longer. They decided to wait one more day, and live among the cult. And learn they did! Valuable information was uncovered about the exact layout of the mines that completely changed what their plans are for after they deal with the High Priestess. One of the players decided to spend the day exploring the nooks and crannies of the temple. The mines were built by dwarfs many years ago, before they were slaughtered by the cultists that now occupy it. Because of this there are several areas that are just plain not used, as the new residence doesn’t have as much need for all the space. Well, while exploring, he found a scroll written by the dwarfs explaining a huge diamond that was cut as a tribute to one of the big dwarf goddesses. According to the record, the dwarfs hid and protected the diamond very well in these very mines when they had to flee many years ago when the cult showed up. This caused the player to take extra time in the next areas he searched, as now he had something that he could actually potentially find! So he decided to take 20 in a rather inconspicuous empty room, and with his amazing perception and taking two, he still only barely managed to find an extremely well hidden secret door in one of the walls. With the assistance of his Warlock friend, he spend a couple hours and managed to break through the Arcane Lock sealing the door shut. Beyond it was a huge diamond on a pedestal in a fairly large very ornate room. No carvings of men and demons copulating and women of all races being raped and every other despicable act imaginable was here like the rest of the mines had become littered with. This room had beautiful carvings of the dwarven goddess. Taking care, they decided to look before they stepped. It’s a good thing they did, because the ranger spotted a very well hidden huge trap door immediately inside the room, and the warlock detected some very powerful magic on the pedestal. They decided to head back and fetch some of the others before doing anything, just in case something went wrong. When the Invoker and Paladin got there, the Invoker was able to detect that the pedestal was indeed an extremely powerful magic trap, the exact nature of which was foreign to him. They decided to try something pretty clever: They all went around the corner (out of line of sight of the trap) and the Invoker summoned his Unseen Servant (level 1 ritual) and commanded it to go fetch the diamond. Seeing as the unseen servant is invisible and doesn’t actually apply any sort of force on the ground, it was a pretty good idea for avoiding most normal traps! They didn’t even peek around the corner, for fear of some devastating effect coming from the trap. However, this trap was not fooled. Shortly after commanding the servant to get the diamond, every one of them felt a strong assault on their minds. Some of them resisted but for others it was too much. They suffered psychic damage and they found themselves thrust against the wall with great force. The invoker felt the mental bond with his servant break; clearly it had been destroyed. They also heard the whirring and clicking of several mechanical devices quickly wind up, coming from that trapped room. Finally, the door leading in to the small room before the trap all of a sudden became blocked by several thick horizontal steel bars. Looking around, they saw that the two other doors that provided escape from the hallway they were in were now also barred. Their fears of what might happen next were quickly extinguished however, as the noise of the whirring trap started to quiet down. Seconds later, the entire place was silent again and the bars retracted in to their doorways, and the secret door automatically closed. Now armed with more knowledge of what they are going up against, they decided to fetch the Dragonborn Warlord, the last member of their party, to come help them. They figured they might need the healing. They spent quite some time discussing options. They knew the trap had psychic attacks and some sort of spinning mechanism but unfortunately knew little more about how it functioned or, more importantly, what exactly triggers it. The decision was made for the ranger to make a running rump diagonally from the secret doorway in to the room, so as to avoid stepping on the trap door. Once inside he planned to take a closer look at the trap, hopefully without triggering it. He would have a rope tied around him, and the Dragonborn had the other end tied to him, which he would keep taut, in the event that he were to fall in to the trap door. The roll was made. The jump was successful. However, what they feared might happen did indeed occur: The trap activated the instant he leaped in to the room. Now with a clear view of the thing, he saw that the pedestal had several curved blades tucked in to itself, and as countless gears started to click and spin, he saw several 10 foot long blades spinning in alternating directions, making reaching the diamond quite challenging. 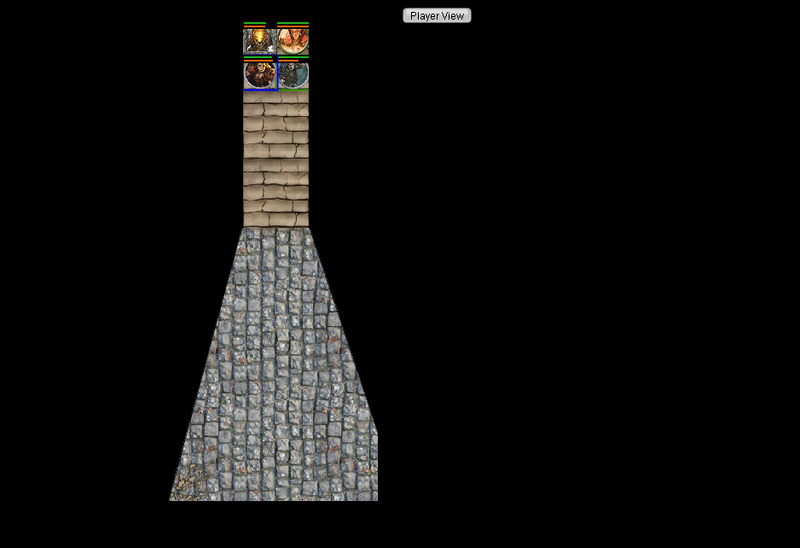 The Dwarven Paladin, the protector of the group, was quickest on her feet. As soon as she heard the trap start to engage, she activated her Benign Transposition to trade places with the ranger. If anyone was to face the full force of the trap head on for the sake of retrieving a holy Dwarven treasure, it was her! 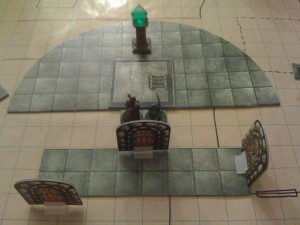 Moments later, the bars once again blocked the three doorways, locking the Paladin in the pedestal room. The party quickly discovered that this trap was far more dangerous than they had anticipated. It constantly barraged every one of them, even the ones out of line of sight, with a psychic attack that not only pulled them towards the bladed device with great force, it also left them dazed, unable to put their own turns to great use. The Paladin got pulled in to the blades as they promptly swatted her away. The diamond was her objective, so she threw a hammer with great force directly at the jewel. Her aim was true, but was saddened to find that the diamond did not budge one bit, seemingly affixed to the deadly pedestal. The Warlock tried to blast the trap with some eldritch energy, but he was unable to land any significant hit against the spinning contraption. The Warlock was then horrified to discover that when the trap next assaulted his mind and yanked him towards it, the bars keeping him out of the room quickly snapped open to let him through, slamming shut behind him. Finding himself at risk of being pulled right on to the trap door, he attempted a move so crazy, it fit his personality perfectly. Just as his feet left the ground from the force of the attack, he pushed off to assist the throw. He turned his body and threw the largest side of his body at the blades themselves. His plan worked; the blades landed a nasty cut along his back but the force of the blow reversed his direction in mid air, causing him to just barely land on the safe part of the ground. Before he could really appreciate the life saving maneuver he had just pulled off, he saw that his ranger friend had also been pulled along with him, only he landed on the trap door. It opened a split second later dropping him 40 feet in to a pit. A second after that, a set of bars shot out half way down the pit, trapping him at the bottom. Quickly glancing around, he saw that this pit had several holes in the wall, out of which a number of disturbing things could come. After some quick thinking, the Dragonborn yelled to the Paladin to leap in to the pit. She hesitated only a moment. This Dragonborn’s bravado has gotten her in to trouble before, but looking around she didn’t have any better ideas of her own. She leaped in to the bit, avoiding the spinning blades that the trap continued to try to pull her in to. She only fell about 10 feet before she ended up dangling against the wall of the pit, held up by the rope attached to the bars above. From there it was trivial to climb up the rope. The ranger was on his own, however. While the rest of the group scrambled to try to get everyone close to the gate for the Dragonborn to pry open again, the ranger discovered what came out of the holes in the bottom of the pit: poisonous gas. Struggling to stay conscious, the ranger found that his greatest ally in this hopeless situation was the psychic trap above! As its psychic attacks continued, he found that the amazing force of them was strong enough to thrust him in to the air with each attack. Working through the splitting pain of the attacks and the poisonous gas filling his lungs, he managed to grab hold of the bars overhead when lifted by one of the attacks. In a spectacular show of adrenaline-fueled strength, he managed to pull one of the bars out of its resting slot, creating just enough room for him to slip through. As the next predictable psychic assault occurred, he let down his own mental defenses, allowing the trap to fling him even further up the pit. He slipped past the bar he had pried open. Were it not for the Dragonborn’s Rousing Words, the stress of the situation would surely have defeated him completely. Now standing atop the bars half way down the pit, he saw a length of rope come flying over the edge. The Invoker had managed to get more rope from his pack and toss it down. Shielding his mind from the psychic assault of the trap above, he sprinted towards the rope and climbed up the wall. The instant he reached the edge, it was the Invoker’s time to shine. He quickly spoke a few words under his breath, undoubtedly communicating with the many gods he served, and summoned a powerful divine magic. Every single one of his allies found themselves awash in beautiful bright light. A moment later, their familiar surroundings returned, only now they were on the other side of the bars, around the corner from the trap. The Invoker had caused them to step through the Astral Sea, bypassing the physical barriers in their own world. The whirring slowed to a stop. The psychic assaults halted. The secret door closed once again. The bars retracted. How will the players proceed? Will they try again, now that they know more about how the traps function? Will they leave it be while they continue their eradication of the cult, hoping to return later when they are more powerful? These are things we will find out next week! I killed my first Player Character last night. I killed three, actually. Playing as a Dungeon Master in Dungeons and Dragons has always been one of the most challenging gaming experiences in my life. It is the DM’s responsibility to create a balanced and fun gaming experience, with “fun” being a highly subjective concept to begin with. I have long felt that the idea of a “Total Party Kill” wherein the players fail in a way that causes every character in the party to die, means that the DM has failed. The challenges created by the DM should be balanced and always have a way for the players to survive. One or two character deaths is okay, but if every single player dies, that’s a problem. Sure, the DM can throw an impossible challenge at the players, but it’s the DM’s responsibility to communicate to the players in some way that the fight is unwinnable. But what happens if the DM does this, and the players still choose to fight? Should the DM find a more obvious way to let them know the reality of the situation? Should he fudge the dice and allow the players to narrowly win the fight? Should he just go with it and kill all of the players? These are the sorts of questions a DM has to deal with very often, and it’s not like the DM has time to sit and really think about what to do; these important questions usually come up in the midst of a session where the DM has to make these choices on the fly. Well, last night I was faced with a similar choice. Here’s the situation: The players found a dragon. They were, understandably, quite intimidated! This is a group of level 1 players who thus far have encountered a group of zombies, a few orcs with wolves, and a band of kobolds. That is the entire extent of their adventuring career! The dragon was supposed to be deeper in the dungeon but they found a shortcut of sorts leading in to its lair. Despite a warning mechanic involving ghost descending in to the lair followed by a loud roaring noise, they decided to check out what was in there. Minutes later, the group’s healer found himself nose to nose with a young black dragon. Because there were only 4 characters who had only found one magic item so far, I scaled the dragon’s stats down a level that I felt would provide a difficult, but possible, challenge. I expected a character to possibly die during the encounter, but for the players to kill the beast. 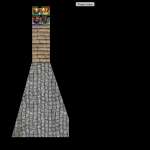 The players would have none of that however and decided to run away from the room they were in, backtracking to a room they felt would be safer. To get there they had to move through a narrow corridor and thought that the dragon might not be able to follow them. I guess none of the players were aware of the “squeeze” action, which allows any creature to become half his “space” (while granting combat advantage) in order to move through a small area. When the dragon did end up moving through this cooridor, they paniced. Instead of recognizing the immense tactical advantage they had because of the geography of the room they were in (there was another small cooridor they could have used as a choke point, forcing the dragon to squeeze if he wanted get at them, or go around the long way which would waste valuable actions) they thought it would be best to run through a door they had never before entered, hoping to shut it behind them. Both my co-DM and I were screaming “no!” to each other (we’re playing online, so the players can’t hear this) when they were discussing the possibility of opening the door. 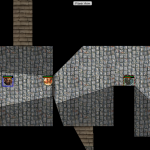 We thought that surely one of the players would point out the foolishness of opening a door leading deeper in a dungeon that they had not explored yet and thus far had had monsters lurking around every corner! Surely they would realize that a dragon is not as bad as a dragon plus more monsters! Surely they would realize that closing a door is only going to possibly prevent the dragon from getting at them for a round or two at most! Sadly, they did not, and open the door they did. This was when my co-DM and I had to quickly decide what to do. We had designed the dragon to be a winnable fight, especially given the layout of the previous room, but we knew that if we introduced the entire extra encounter that was behind this door, the players would die. This was one of the hardest decisions I have ever had to make as a DM. Do I put the kobolds in this next room as designed, knowing that it will definitely kill at least some of the party, or do I cheat by clearing the room or lowing the stats of all of the monsters involved so that the dragon plus kobolds still equals the challenge of one encounter? Or maybe I could have the kobolds be hostile towards the dragon so his attention gets split, perhaps making the fight easier? In the end, I decided to run it as designed. An easy mistake a DM can make when running a game is to make the players invincible. No matter what the players encounter, they will always win regardless of whatever bad decisions they might make along the way. The DM fudges the dice where needed and rebalance the encounters as neccesary to ensure the players always come out victorious. For some groups this might actually be fine! If the objective of the game is to tell a story of heroes conquering challenges, then what is the problem with them succeeding? I feel, however, and I think most players feel, that the game is more fun if there is an actual risk of failure. We’re playing a game and as such it is possible to lose this game if you do not play it well enough. In the end this is why I decided that the decision of opening a door deeper to an unexplored dungeon was a big enough lapse in judgement that the players deserved what was coming to them. But listen to me! That makes me sound like the bad guy! Maybe I am, this time. I decided to scale back the difficulty a bit to give the players some extra time to retreat if they so chose. I figured after a few rounds of seeing the dragon not get bloodied while the players took significant damage, they would definitely choose to retreat. They did not. Despite me not using some of the dragon’s more nasty powers (such as the ability to retaliate against any enemy that misses it in melee combat) the players started to drop like flies, yet they still stood their ground. Several rounds later, 3 of the 4 players were knocked unconcious and the fouth decided to make a run for it. Having previously used a daily power that granted him considerable extra speed, he was actually able to outrun the dragon and leave his new friends behind. We called it a night and everyone went home. It was past midnight and I was sleepy so I went to bed. However, I didn’t sleep. As I mentioned, this is the very first time I have ever killed a player in my DMing career and I couldn’t stop thinking about it. Did I do the right thing? Will the players still want to play if they have to roll new characters? Did I value the game mechanics over the fun factor (which is expressly forbidden in the Dungeon Master’s Guide?) These questions and many more were torturing me as I tried to reconcile what had happened. There are many ways I could have saved the players. There are many ways I could still save the players. Perhaps the dragon wants them kept alive for some reason? If I do that, am I essentially just going back to the “it’s impossible to fail” situation I wanted to avoid in the first place? I am still not sure. I went over all of the ways I felt the players could have done better in my head: Someone should have made a knowledge check after hearing the roar to see if they could identify the creature. They should have fought the dragon in the tight spaces where it would have been at a disadvantage. The defender should have used more marks to draw the dragon’s attention and give him a penalty when attacking the other players. 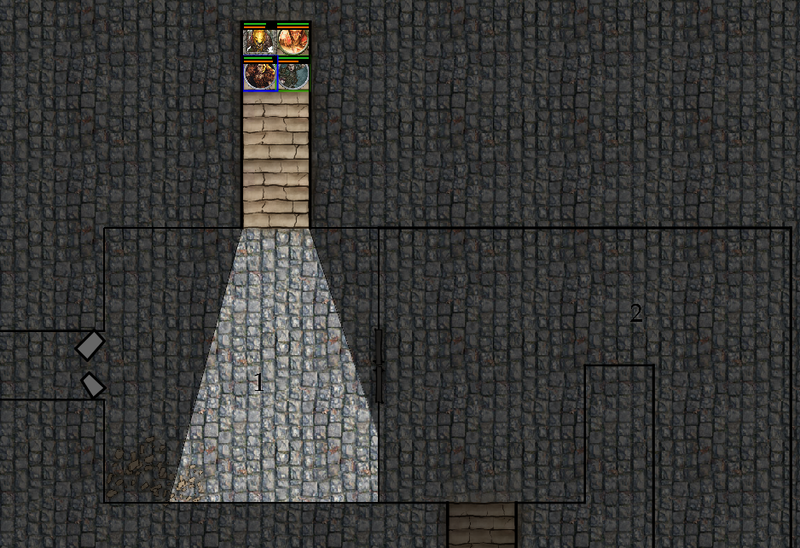 If the players did choose to run, they should have run towards the entrance to the dungeon instead of deeper in. I also thought of the things I could have done better: Maybe I should have prompted the players to make the knowledge check? I don’t like to do that but these are still new players who often don’t remember the little things that are possible. Maybe I should have locked that door they tried to go through to make it harder for the players to entire a dire circumstance. Maybe I should have outright warned them of the danger of going deeper in to an unexplored dungeon? Maybe I should have reminded them about the squeezing rules so they would have known the dragon was going to follow them? In the end, I feel that I made the right choice in the way I ran the events. I somewhat regret not giving another warning or two against possible courses action, but at the same time I am not sure that I should have. Yesterday I played my very first game of Dungeons and Dragons through the Internet. I am happy to say that it was a success! I played with some fellow members of the online gaming community Shacknews. When figuring out how we were going to play we investigated several different possibilities for a “virtual tabletop” solution. Essentially we needed something that simulates the playing surface you would use if you were playing in person. This means it needs to allow players to roll dice, move tokens around a map, and share information like character sheets. In the end it came down to two choices: Fantasy Grounds II or MapTool. While FG2 is a much more polished looking tool, we decided on MapTool mainly because it is free. To use FG2 we would have needed to have every player buy a license which was more money than most were willing to put in to what was essentially still an experiment. We discovered Veggiesama’s Framework, which is a complex set of macros and scripts that brings 4e support to MapTool. It’s rather daunting to set up, but not very much moreso than MapTool itself. I figured it would be worth the learning curve if it helped facilitate speed of play. We also decided on Ventrilo for voice chat. Our official start time was 7pm, although I connected with one of the players an hour early so we could start making sure everything was set up and working. We didn’t actually start the game until about 8:15 due to needing to set up the rest of the players in Veg’s Framework. Once we did start, however, the gameplay was surprisingly smooth! We hit a lot of little snags, but I estimate that it was no more than the number of snags a bunch of first-time players would hit when playing in person. By the end of the night (11pm) we managed to completely finish the first encounter, which was the very best I had hoped for. As the DM, I can see the entire map. The players' view after exploring a bit. 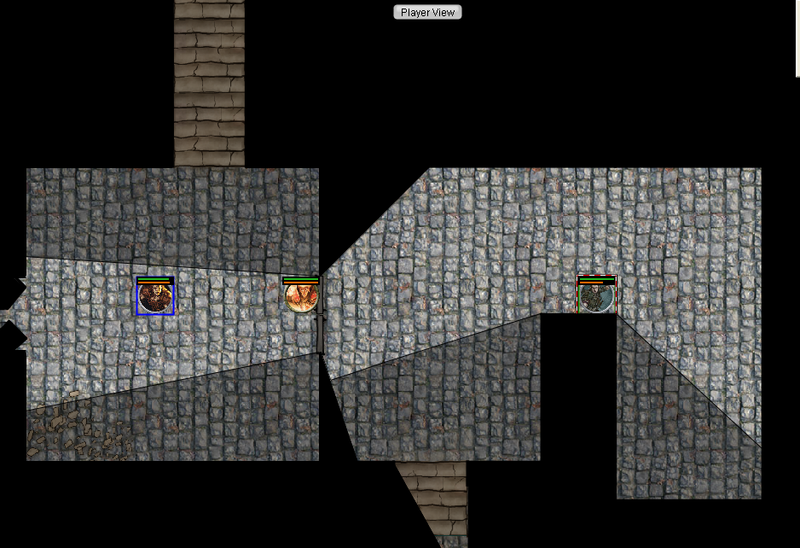 The third image illustrates my favorite part about the whole thing: Vision is on a per-player basis, meaning that the halfling I have selected (on the right) actually can’t see his fourth party member because that member is back in the first room around the corner. 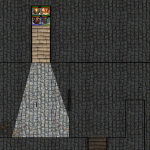 At one point in our session one of the doors slammed shut on its own and monsters started attacking on one side of the door. The players that were on the other side of the door completely lost vision to the other room, so they couldn’t see exactly what was going on. I think this element has the potential to really create some cool suspense in our game.